McDonald’s Frozen Strawberry Lemonade is the perfect answer to a hot summer day. You can make this tangy, icy, and sweet treat at home. One of the best things about making your own copycat recipes at home is you can make as many as you like, and you can change up the recipe for your personal tastes. One of the drinks that remind me of summer is lemonade, I love lemonade. Lemonade is so thirst quenching and is my perfect answer to a hot day. I assure you, living in Texas, we have plenty of hot days. McDonald’s created a wonderful drink that they prepare for you when you order this particular drink. Guess, what, you can prepare this frozen lemonade at home too. Want to quench a summertime thirst? Try this copycat McDonald's Frozen Strawberry Lemonade. Prepare 16 ounces of lemonade, I find that Country Time drink mix works very well. Prepare the lemonade according to the package directions. Place 16 ounces of lemonade, and 2 cups of ice in a blender. Blend until the ice is crushed completely. 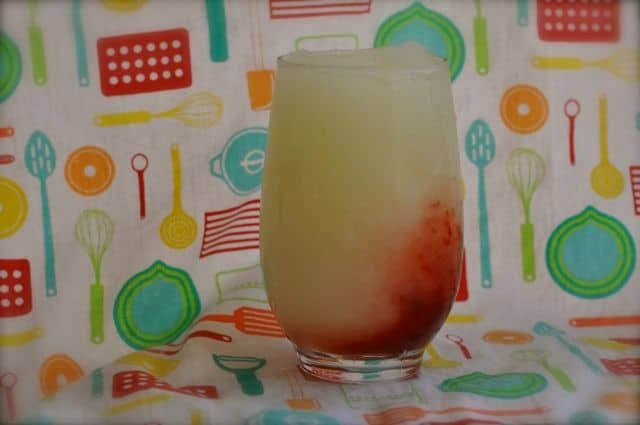 Place about two tablespoons of strawberry ice cream topping in the bottom of a glass, and then pour frozen lemonade over the strawberry topping. If you want a really easy cold strawberry lemonade just throw your lemonade into a blender and add strawberry sorbet to it rather than ice. You can also mix it together and freeze in plastic containers to use as the “ice” for a punch. That’s NOT REAL Lemonade! Shame on you McDonalds serving that crap!!! The ONLY lemonade I’ll drink is the REAL PURE Lemonade I make!! The recipe is on this page, how are you connecting to the internet? Thank you for posting this recipe, I’m addicted to these things! I have a couple of questions: what type of strawberry ice cream topping do you use? Perhaps it’s just my crappy blender, but I find that the consistency is not the same as when I buy it from McDonalds. (Mine is more foamy?) Do you have any tips on how to make the drink look more accurate (perhaps a setting on the blender)? I use a vitamix on high power and on the 10 setting for a couple of seconds. I don’t have a standard blender any more. The strawberry topping I used was Mrs. Richardson, I believe McDonald’s has their especially made for them. Just amazing! Fresh squeezed lemonade works well too if you have the time to make your own lemonade. I am sure this would be real good with fresh lemonade as well. Absolutely Refreshing! Must mention that the Red shade looks an even more captivating look to the beverage. Cheers ! This was really tasty. I used frozen strawberries instead of the strawberry topping,they were chunky, but it tasted good! Dangit woman! You are a genius! I love these! Thanks for sharing!